best traveling companion a genealogy/family history researcher could have. It is definitely a must have and well worth it's weight in gold. I had to share this wonderful tool with you that I have been using since 2008. I keep The Next Exit in my car and it has come in handy so many times. When I took my first genealogy research trip from California to Kentucky in April of 2008, The Next Exit was a lifesaver and I wouldn't travel without it now. Even up to Los Angeles, which is only an hour and a half away, this book comes in handy. It has every exit in every state, and this book will tell you what is at each exit, i.e. food, gas, camping, lodging, restaurants, hospitals, shopping and will tell you if there are any exits under construction. I only wish cemeteries, libraries and family history centers were also listed...hmmm...may have to suggest that to the makers of this great book! This exit directory, does exactly what it's purpose is intended to do. As we would choose our exit according to the directory, the facilities that were listed were actually right where they said they were! It sure saved us time and gas (as it says on the cover!) I am not sure why I didn't think to share this sooner, but after receiving it today...I knew that it would be so helpful to so many of us that travel all over for our research. The user guide is very friendly...in fact, I didn't even need to use it, that's how easy this directory is to use. 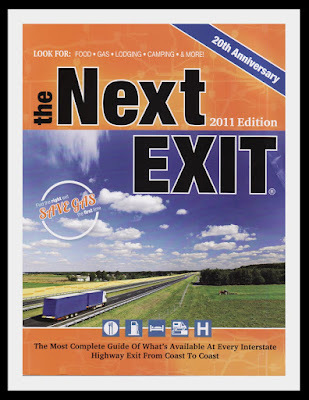 Disclaimer: I am not affiliated nor have been asked to promote "The Next Exit." I am just a very happy customer who loves the product and swears by it. I paid full price and it's worth every penny. I am usually not one to post about these kinds of things but this was a must do. I have this same book and I agree it is great. Mine is the 2008 edition. Wonder if there are many changes. I also have a copy of the RV'ers friend. We have a blow up mattress and stay in the back of our mini van sometimes when traveling. Some nights in motel some nights at truck stops, camp grounds and casino parking lots. That is a great place to stay with the all you can eat buffet and with letting them know we are staying we feel safe. I would not travel with out either book. Thanks Gini for showing and describing this book. I have never heard of it, and now will buy it, as it sounds perfect for some of my future trips. Again, thank you. That is awesome. Thanks for letting us know! It will really make road trips much easier. I am so glad that you took the time to post this. I am going to go order my copy now. This looks like something very useful. I may have to get one. Thanks for sharing! I just ordered a copy. Thanks for the tip! It will be INCREDIBLY helpful.